The leaders of Russia and China met in Moscow Monday to discuss the Iranian and North Korean nuclear programs, and cooperation within a post-Soviet security organization and in space security. 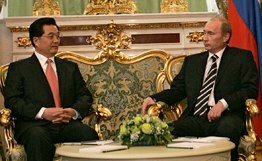 In their joint declaration concluding the first day of the Chinese leader's three-day visit to Moscow, Vladimir Putin and Hu Jintao said Iran had the right to peaceful nuclear energy if it observed the Nuclear Non-Proliferation Treaty (NPT). "Russia and China believe that Iran's nuclear problem must be resolved purely through peaceful means and negotiations," said the joint declaration. Russia, which is building a $1-billion nuclear power plant in southern Iran, has been following a softer stance on Iran and opposed any tighter sanctions against the country. At their meeting in Moscow, Putin and Hu also agreed to maintain intensive cooperation in other international affairs, including within the Shanghai Cooperation Organization (SCO), the Russian leader said. "We are positive that our joint efforts will help enhance the security of Russia and China, and will promote stability in Central Asia, in the Asia-Pacific Region and in the world as a whole," Putin said after Hu announced last week the SCO was preparing for further expansion. Apart from Russia and China, the organization presently includes Kyrgyzstan, Kazakhstan, Tajikistan and Uzbekistan. India, Iran, Mongolia, Pakistan and Afghanistan have observer status. They had a great show to go along with this. Great Chinese artists, symphony, ballet, acrobatics. They were really something. And when you saw their faces, you could tell that doing their best for their Russian friends really meant something for them. Putin of course looked bored as hell. What do the people on the ground think of Russia and China cosying up Adam. Is it seen as a positive or negative by the locals?